Tony reverted to his old sleazy womanizer ways, but wasn't able to ignore that pesky inner investigator voice. Other members of the team also struggled with the "open and shut" shooting case, resulting in a late night reunion at the crime scene, on NCIS Season 13 Episode 17. How would you describe the story, in a few words or a sentence? David: Open and shut...and open again. Christine: Never trust an easy case. Doug: The decline of a pickup artist. What's your take on the case of the week? David: Well....it did present a mystery to be solved so it had potential. But a victim exacting revenge isn't anything new so the potential went unfulfilled. Kathleen: It was okay, I guess, though I did want to bonk those two knuckleheads for being so stupid. They created a conspiracy where none was needed and wasted the very valuable time of an elite crime-fighting team. Christine: Even when those two were telling the truth, I still didn’t believe them but Gibbs must have or he would have charged them with obstruction. I loved how the team put all the inconsistencies together but the case itself was a little lackluster. 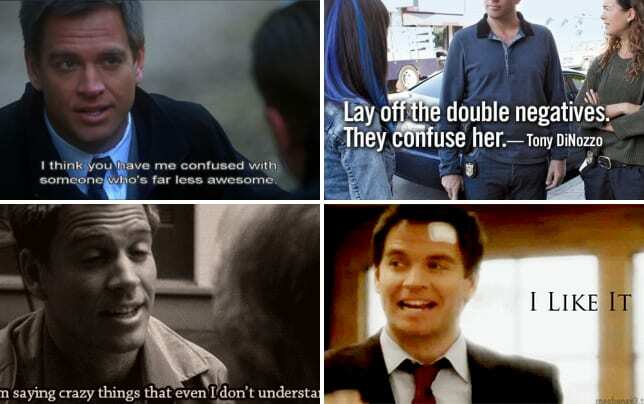 Doug: I suppose I get why Gibbs didn't want to charge them. It would have meant putting the girl through a lot more trauma than she needed. Still, those non-case (that local police could have handled) was irritating. David: McGee's "You testing me?" After the download dinner disaster (playing with your food, McGee? How old are you? ), I felt sure McGee was going to re-start the conversation, but Delilah did instead. And McGee didn't immediately take the bait – he inspected it first. Kathleen: I was in awe of McGee's arts and crafts skills when he recreated that crime scene with dinner. Frankly, if I were Delilah, I'd have been more impressed with the fact that he managed all that while I was in the bathroom! Christine: When they called the victim’s three ex-wives and the last one wanted to know where to send the thank you note for shooting him. When Gibbs quipped, “I have no idea how to relate to that.” I literally laughed out loud. Doug: I liked the importance and gravity of Delilah's observation that she didn't want to end up having a dysfunctional marriage like Bishop's. That was a key moment for the two of them. Who was the MVP for this episode? David: Given my response to the previous question, I'm going with Delilah. Not only did she provide evidence of an inconsistency, she also accompanied McGee to the crime scene – even after their argument. Kathleen: Count two for Delilah. She was frustrated with the apparent failure of their "download dinner," but she then sets it aside (if for no other reason than to solve a niggling puzzle, for a case that wasn't even hers!). Christine: It’s unanimous. I liked that Delilah’s reasoning for the Download Dinner wasn’t random. She’s taken Bishop’s marriage as a cautionary tale and she wants to make sure that she and Tim have a life outside of work…but that didn’t stop her from wanting to solve the case. 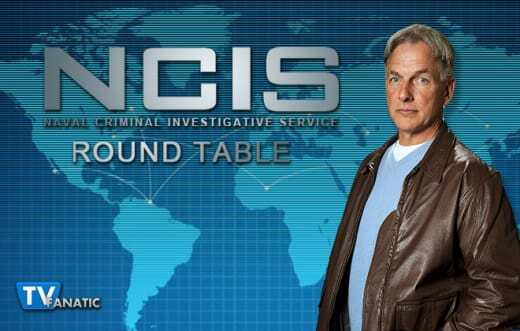 Doug: I wanted to go with Tony because of his performance in the interrogation room. Maybe because that's a side of him we rarely see. But his lounge lizard performance was so off-putting I couldn't do it. So yeah, let's make it unanimous and go with Delilah on this one. What are your thoughts on Leah? Kathleen: I feel a bit bad for her. Tony came across as blatantly manipulative in his sequence, and then he didn't even allow her to enjoy herself as he was too busy going on and on (and on!) about the case! She was right to say "so long" the way she did. Christine: Leah was obviously a short term conquest for Tony, not a long term relationship. Yes, the date went badly but anyone Tony gets involved with seriously will have to enjoying solving a good mystery as much as he does. Doug: I saw her as the female counterpart to Tony. In that instance she was putting just as much of an act as he was, and for the same goal. So I guess there was nothing to worry about, in terms of Tony wanting to establish anything long term with her. She was only ever going to be another notch on his bedpost – and he on hers. Jeanne's still in the running. What problems, if any, did you see? David: I heard something about the agents earning lowly government salaries...but then there's Tony's museum-like apartment. If he can afford a place like that, what's he need with a potential mate who's a trust fund baby? Kathleen: I seem to remember it being stated pointedly in earlier seasons that Tony just doesn't invite people (especially dates) to his apartment. He likes to keep it private, to himself. So, did something change, or was that entire date a giant discontinuity? Christine: I was thinking the same things. First off, Tony’s apartment is amazing! Secondly, didn’t he only have a twin bed because he never takes dates home? If that’s changed we’ve obviously missed the memo. Doug: Nothing wrong with your memories. There was a definite continuity problem with that apartment. What killed the episode for me was the moment Tony donned his hat and started playing the piano. The entire scene, with Leah sitting on the couch with a wine glass in her hand, and Tony with his hat placed jauntily on his head came off as the world's worst cliché. It was embarrassing to watch, and I was glad when it was over. Tony: There's no way Petty Officer Muldoon would have taken him three shots to drop that guy. He would have nailed him on the first shot. He's a pro! Leah: Yeah, well pros do miss on the first shot. You sure as hell did. Listen. Tony. You're clearly somewhere else and I'm starting to think that I should be too. Tony: Oh no. I'm so sorry. Please, give me a second chance. Tony: Oh. Okay. When can I see you again? Leah: Never. I just really want to know how this case you've been talking about for the last hour, turns out. Tony: See, this is why we shouldn't go home at night. There's no point. Tony: Probably the same place your download dinner went, Mcbite me. Permalink: No point going home.